Comets are frozen remnants from the formation of our solar system. They live on the outer edges of our solar system until some gravitational perturbation causes them to sweep near the Sun. Because they have been relatively undisturbed for most the Sun’s history, they provide an excellent window into the chemistry and composition of the early solar system. Which is why it’s interesting that ethyl alcohol has been observed in the tail of comet Lovejoy. 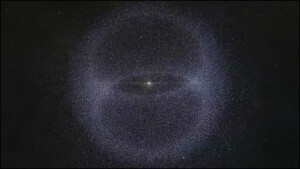 Lovejoy is a long-period comet, which means it’s probably originates from the Oort cloud, and hasn’t had time to become contaminated by material of the inner solar system. Finding ethyl alcohol streaming off such a comet is somewhat surprising. We’ve long known that alcohol is plentiful in space, but much of it is in the form of methyl alcohol, which is a simpler molecule than ethyl alcohol. In this case, it seems the more complex alcohol formed through surface chemistry interacting with ultraviolet light. The team also found quantities of glycolaldehyde, which is a simple sugar-like molecule, which also supports the surface chemistry idea. Compounds such as these are necessary ingredients for life on Earth, so its possible that comets similar to Lovejoy could have seeded Earth with these molecules through early impacts. That’s still a bit speculative, but it now seems clear that both comets and meteorites contain such molecules, so its within the realm of possibility that they seeded Earth with the building blocks of life. At the very least the observations of Lovejoy show that these molecules formed in our solar system early in its history.